The two clearly have a great relationship; they’re often spotted at public events together, pulling off the twinsies look perfectly. So it’s fun to catch a glimpse of their affectionate — yet snarky — bond on social media too. And it’s reassuring to know that even supermodels get teased mercilessly by their teen offspring. When Crawford posted her latest Instagram pic — captioned “Versace Versace Versace Versace” — Gerber was definitely paying attention. In the pic from a recent InStyle photo shoot, Crawford is posing up a storm with her arm around the shoulders of a hot young male model (wearing only Versace briefs) who is clutching her calf and lustily painting her toenails — red, of course. Gerber quickly pounced on the opportunity to call out her mama in the comments. “MOM!” she wrote first. 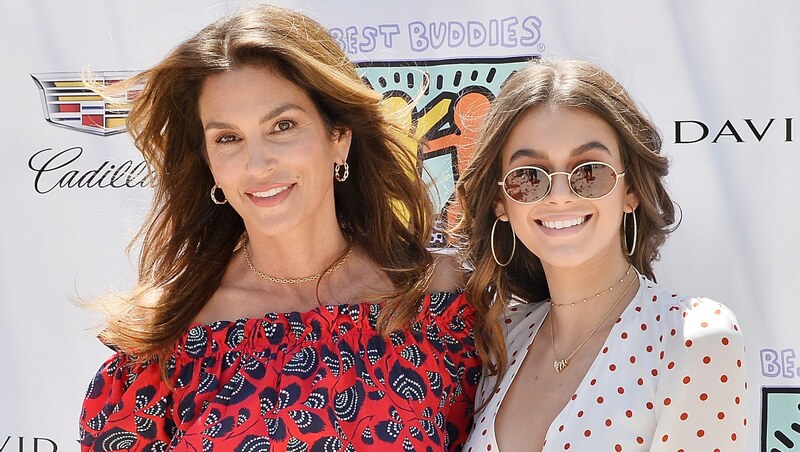 Then she posted another comment: “where’s dad,” referring to Rande Gerber. Nicely played, Grasshopper Gerber; the force is strong with this one (I know those aren’t the same show… sorry). The entire Versace-clad photo shoot is full of delicious male models doting on Crawford by a pool and pouring her tea. We’re pretty sure her daughter didn’t actually mind the racy spread, as she’s now in the biz herself — and scoring covers like British Vogue. But she’s definitely got her dad’s back, as evidenced by this adorable father-daughter selfie she posted on Instagram. And if you haven’t had enough of the most photogenic family walking the planet (sorry, Beckhams, you were a close second), how’s this for a family picture, posted by Crawford at Thanksgiving? That's a wrap. Happy Thanksgiving everyone! All those cheekbones just sliced open our corneas. How come our family pictures look nothing like this?